He says inequality will be a key theme in the 2019 election. NDP Leader Jagmeet Singh arrives at his party's policy convention in Ottawa on Feb. 16, 2018. 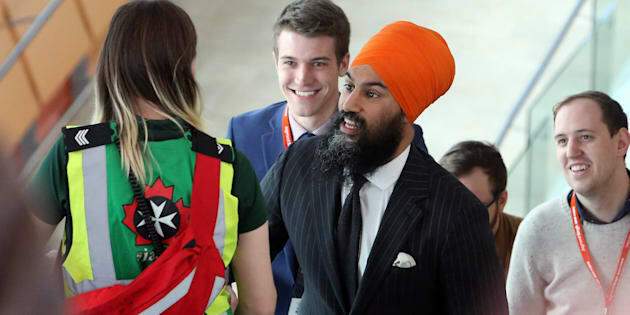 OTTAWA — NDP Leader Jagmeet Singh is value-signalling. Those initiatives he enthused about on stage at last weekend's NDP policy conventions — including universal dental and eye care programs, free post-secondary tuition, and re-opening the Constitution to include Quebec — are not campaign promises. Instead, they are "values" that will "inform" how the NDP talks about its 2019 platform, Singh said in an interview with HuffPost Canada's politics podcast "Follow-Up." "The theme around inequality and how we tackle inequality, that is going to be a big plank of our offer," the newbie leader said. "How we package that I'm not sure, but these are all the feelings, and the vibes, and the values." Singh said he was moved by a UBC study that suggested 1.69 million Canadians are skipping medication, reducing doses, delaying prescription refills or not filling them at all because they can't afford the costs. The NDP has pushed for universal drug coverage in past elections and last October it tried unsuccessfully to move a motion in the House of Commons calling on the Liberal government to begin negotiations with the provinces towards a pharmacare program. Singh has begun talking about taxes as "investments." He told a crowd of 1,700 delegates in Ottawa Saturday that outsiders would try to suggest that "the government is your enemy ... And that taxes take something away from you, rather than giving something back to all of us." Singh's talk of re-opening the Constitution is also just talk, he suggested. "Our Constitution should be a value-espousing document that actually unites people, it brings people together. The fact that Quebec and First Nations are excluded, it sends a message that that it's not inclusive," he said. "The resolution doesn't say what the process would be, and I don't know what the process is," he admitted on the podcast. The resolution that Singh urged delegates to support says repatriating the Constitution in 1982 without Quebec's signature was a "historical mistake" and that the party would welcome any serious effort to recognize Quebec's status as a nation and to ensure that it is a part of the Canadian constitutional framework. "What I'm committing to is it's a value, that I recognize that this is an injustice and it needs to be addressed," Singh said. "I don't know what — we'll look at the different solutions in terms of how we fix that problem...but the values is what we want to focus in on, that it doesn't make sense that we have people excluded from our Constitution. That is something that I want to say that as a value I get, I know that that's unjust and I wanted to do something about it." On the weekend's more controversial topic of Israel and Palestine, Singh also wanted to talk about his values rather than take a position. He declined to state how he would vote on a motion calling on Israel to end its settlement program and lift the Gaza blockade, and to ban all products in Canada from Israeli settlements. Supported by 27 riding associations and three youth wings, it was one of 12 pro-Palestinian motions that had enthusiastic grassroots support but was pushed off the priority list by the party executive. Singh said he blames the violence in Gaza, for example, on U.S. President Donald Trump for increasing "tensions" in the region through a decision to move the U.S. embassy to Jerusalem. "I believe in Israel's right to self-determination and be a country; I believe in the Palestinian people's right to have a country. I believe in the fact that all people should get to live with peace, dignity, and security," he said. "These are my values and the resolutions are something that members will decide." Except that several members feel they weren't given that chance. Yazan Kadher, a young NDP activist, told HuffPost that "the party central doesn't care about what members want; it cares first and foremost about what would make it look better. "We are not counting on Mr. Singh to champion Palestinian rights, we are just saying let members decide and when members decide, accept it. You don't need to agree with it, but you need to accept it." A delegate gives a standing ovation to NDP Leader Jagmeet Singh as he speaks during the policy convention in Ottawa on Feb. 17, 2018. On the Boycott, Divestment, Sanctions (BDS) movement, Singh won't take a position. "I have not made a commitment to say that is part of our policy or not our policy." "I think it should never be conflated with anti-Semitism, which I denounce and I abhor and it's something that should not be allowed to grow in any fashion, but the criticism of a government's decisions or its policies or its military action is something that people can criticize and then use whatever vehicle they want to criticize it." On the current fight brewing between the NDP governments in Alberta and British Columbia, Singh confirmed he hasn't picked up the phone to call premiers Rachel Notley or John Horgan. He doesn't view it as his job. He says both premiers are doing what they told their constituents they would do. "It's not a feud that needs to be mended between the two provinces," he said. If he was prime minister, Singh said he would send the Kinder Morgan Trans Mountain pipeline project through a new, "up-to-date modernize environmental assessment process." But as he describes it, his environmental assessment process would look very similar to the one Environment Minister Catherine McKenna announced earlier this month. "I don't know if their process is the right process, but it's got to be a modernized process, that is science based, and that is independent," he said. Singh initially took issue with the fact that the new process is political because the minister retains the right to make a decision that may run counter to the advice she is given. But when pressed, the NDP leader said he supports the government having the right to make decisions, he just wants to make sure the process that leads to a recommendation remains independent and is not subject to "political will." The assessment about whether resource projects hurt the environment or not should be independent, he said, though he acknowledged he doesn't know whether the Liberals' new reforms will address his concerns. "I don't know the details around the [Liberals'] process either, these are just some the things I've flagged as being concerns." Singh says he "could look at supporting energy projects that satisfy three criteria." But it's hard to see how an NDP government he leads could approve any pipeline projects since they would have to: 1) achieve Canada's climate change goals by reducing emissions; 2) create local opportunities for work; 3) reflect the values and principles of the United Nations Declaration on the Rights of Indigenous Peoples (UNDRIP).